Keeping a green lawn takes up a lot of water (not to mention all of that mowing). Areas that are in the sun more need more water – consider changing out part of your yard for a xeriscaped alternative (see below), along with some hardy, drought-resistant plants. You might be tempted to convert *all* of your lawn to a rock garden or xeriscaped space, but recent studies have shown that lawns are important to avoiding heat islands and flooding. You can also try cutting your lawn a bit longer, cutting less often, and watering while it’s still cool so more water is absorbed and less evaporates. Surprisingly, the same goes for windy days – a lot of the water will be blown into the air and will evaporate. Cutting your lawn higher also cuts down on growth stimulation. Use a mulching blade to keep cut grass on the lawn, providing nutrients and retaining moisture. Using automatic sprinklers can save a lot of water as it lets you water late at night or early in the morning. 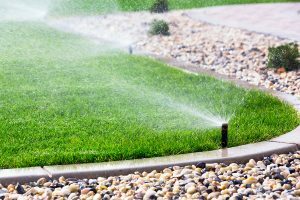 A simple way to save water is cutting down your watering time by a few minutes, and make sure your sprinklers are watering your lawn only – not your vinyl patio, deck, or the sidewalk. Your lawn doesn’t need as much water as you think it does, a few minutes a few times per week is more than enough (or one inch per week). Finally, if there’s rain in the forecast turn off your sprinklers! More advanced sprinkler systems have moisture sensors, so you don’t have to worry about over watering. Extra Tip: Watch your grass varieties – Fescue (a cool-season grass) requires a lot more water than warm-season varieties such as Bermuda. Planting a warm-season variety can cut back water consumption by 20% or more. Growing your own fruit and vegetables is a great way to get local, fresh food – food that you know doesn’t contain hidden pesticides. However, all of this growing takes a lot of water. You can do your part by taking steps to ensure that you’re using the least amount of water possible. A simple way to save water is using a drip irrigation system is the best way to save water, as it prevents a lot of evaporation as the water soaks directly into the soil. You also can choose to water your lawn with a garden hose and only target areas that need water. Did you know? A garden hose can pour out over 600 gallons in just a few hours. Use a pool cover to dramatically reduce evaporation. Reduce the temperature of your pool (which cuts energy costs as well as reducing evaporation). Check your pool for leaks, and have them fixed ASAP. Keep water levels a bit lower so less water is splashed out. Manually clean your filters, automatic back-washing is a huge water waster. Alternatively, consider replacing your pool filter with water-saving models. Plug the overflow line when the pool is in use – this will prevent the continuous influx of water into your pool. Water toys can also be big consumers – avoid toys that need a continuous supply of water, or at least keep them on a dry part of the lawn that could use the water. You can significantly cut back on water usage around your vinyl patio by choosing the right plants and landscaping products. Start by placing a 3-4″ layer of mulch around trees and plants, which will help to retain moisture and cut back on evaporation. Select drought-resistant plants for your yard and vinyl deck, patio or roof deck, which will need less water and can go a long period of time between watering. You can also use drip irrigation, rather than spraying or sprinkling to cut down on water evaporation. When you prune, you encourage new growth (and water consumption) – limit pruning to removing dead branches and foliage only. In areas with regular drought, you can take extra steps to reduce water consumption. For example, you can recycle gray water from laundry systems to water your lawn or use for other household tasks (such as flushing toilets). Put off washing your vehicle in the summer, or head to a commercial car wash that recycles its water. If you have to wash at home, park your car on the lawn so the runoff gets reused. It takes 75,000 gallons of water to produce one ton of steel (or approximately one vehicle). Gasoline that fuels a car requires 1 to 2.5 gallons of water per gallon of fuel. It takes 24 gallons of water to make 1 pound of plastic, fabric, etc. If you can cut back on your use of manufactured goods and increase the amount you reuse and recycle, you can significantly reduce your annual water consumption. Also, choosing long-lasting products that can be recycled at the end of their lifespan goes a long way towards cutting back on your household’s water usage. This is why Tufdek Waterproof Vinyl Decking is a great choice – Tufdek has a long lifespan and is fully recyclable at the end of it’s life cycle.